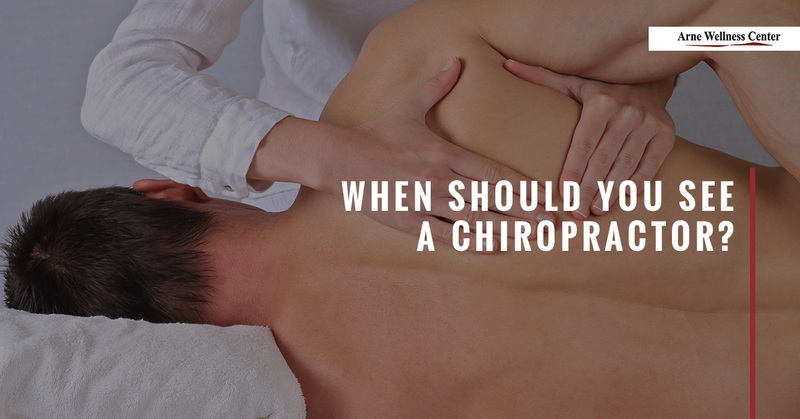 When is the Right Time to See a Chiropractor? Most people refuse to see a chiropractor unless something has gone wrong. Maybe you were in a car crash, or maybe you received an injury during a pickup game of tackle football. Perhaps you woke up with a sore shoulder that just won’t stop, or your doctor just isn’t giving you the pain relief that you need to get through your day. Maybe your back has been irritating you more than normal lately, or perhaps you’ve been struggling with back pain on and off for years. Regardless of whatever you’re feeling, someone has probably said to you, “You need to see a chiropractor!” Brush them off if you must, but here are some of the top signs that seeing a chiropractor may be in your best interests. Notice that we didn’t say that your pain has to be in your back. Many people begin to feel small aches and pains, pop a few aspirin each day for a few weeks, then eventually contact their doctor for a diagnosis and stronger pain medication. What many people fail to realize is that this pain could be coming from part of their body shifting out of alignment. Your body was designed to work as a whole with many moving parts. When those parts are no longer in place, your whole body can experience pain. A chiropractor can assess your whole body and find the source of your discomfort. Are you stuck behind a computer screen all day? Sitting for long periods of time, especially with improper posture, your body begins to feel pressure in your shoulders, neck, and upper back. This pressure can lead to shifting bones and discs, meaning major back problems in the future. A chiropractor will be able to check the alignment of your spinal column and adjust it if need be. For those of you who perform the same task, again and again, each day, you might develop overuse injuries that can cause your body to slip out of alignment somewhere. If either of these sounds like you, it may be time to schedule your first chiropractic appointment. If you have been feeling pain in your legs, regardless of whether it comes and goes or stays, it might be a sign of a pinched nerve or a slipped disc. Your sciatic nerve is sensitive to your alignment, and any misplaced discs could lead to severe pain. If a physical therapist has been unable to help you, a chiropractor might be able to! Your chiropractor will examine you and adjust your spine to relieve the pressure. Headaches have a variety of causes behind them, from artificial sweeteners to dehydration and more, so there is no saying for sure that they are caused due to your spine being out of alignment. However, people who struggle with frequent headaches might be suffering because of misalignment in the upper back and neck. Also, many people who suffer from migraines have reported a decrease in the intensity and frequency of their migraines when they seek chiropractic help. If you are an active person, your body probably sees a bit of wear and tear now and again. While your cardiovascular health and muscles may be seeing a drastic improvement, your spine may not be. This additional pressure over long periods of time can lead to slipped discs, poor alignment, and pinched nerves. If you seek chiropractic adjustments regularly, you may be able to avoid serious problems in the future. Regardless of whether you are experiencing one of the above or all of the above, it’s time to call Arne Wellness Center to schedule your first chiropractic appointment. We look forward to seeing you and providing you with relief for your current back or leg pain! At Arne Wellness Center, we pride ourselves on giving those who seek our help the best in holistic medicine. A healthy body comes from having a healthy and balanced life. Call now to learn more about our services, as well as our chiropractor.